The electric vehicle is not a recent development. In fact, the electric vehicle has been around for over 100 years, and it has an interesting history of development that continues to the present. France and England were the first nations to develop the electric vehicle in the late 1800s. It was not until 1895 that Americans began to devote attention to electric vehicles. Many innovations followed and interest in motor vehicles increased greatly in the late 1890s and early 1900s. In 1897 the first commercial application was established as a fleet of New York City taxis. The early electric vehicles, such as the 1902 Wood's Phaeton, were little more than electrified horseless carriages and surreys. The Phaeton had a range of 18 miles, a top speed of 14 mph and cost $2,000. By the turn of the century, America was prosperous and the motor vehicle, now available in steam, electric, or gasoline versions, was becoming more popular. The years 1899 and 1900 were the high point of electric vehicles in America, as they outsold all other types of cars. 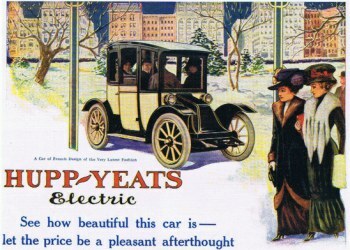 Electric vehicles had many advantages over their competitors in the early 1900s. They did not have the vibration, smell, and noise associated with gasoline cars. Changing gears on gasoline cars was the most difficult part of driving, while electric vehicles did not require gear changes. While steam-powered cars also had no gear shifting, they suffered from long start-up times of up to 45 minutes on cold mornings. The steam cars had less range before needing water than an electric's range on a single charge. The only good roads of the period were in town, causing most travel to be local commuting, a perfect situation for electric vehicles, since their range was limited. The electric vehicle was the preferred choice of many because it did not require the manual effort to start, as with the hand crank on gasoline vehicles, and there was no wrestling with a gear shifter. While basic electric cars cost under $1,000, most early electric vehicles were ornate, massive carriages designed for the upper class. They had fancy interiors, with expensive materials, and averaged $3,000 by 1910. 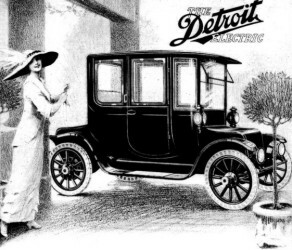 Electric vehicles enjoyed success into the 1920s with production peaking in 1912. By the 1920s, America had a better system of roads that now connected cities, bringing with it the need for longer-range vehicles. The discovery of Texas crude oil reduced the price of gasoline so that it was affordable to the average consumer. The invention of the electric starter by Charles Kettering in 1912 eliminated the need for the hand crank. The initiation of mass production of internal combustion engine vehicles by Henry Ford made these vehicles widely available and affordable in the $500 to $1,000 price range. By contrast, the price of the less efficiently produced electric vehicles continued to rise. In 1912, an electric roadster sold for $1,750, while a gasoline car sold for $650. Electric vehicles had all but disappeared by 1935. The years following until the 1960s were dead years for electric vehicle development and for use as personal transportation. The 1960s and 1970s saw a need for alternative fueled vehicles to reduce the problems of exhaust emissions from internal combustion engines and to reduce the dependency on imported foreign crude oil. 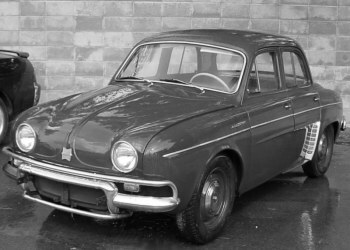 Many attempts to produce practical electric vehicles occurred during the years from 1960 to the present. In the early 1960s, the Boyertown Auto Body Works jointly formed the Battronic Truck Company with Smith Delivery Vehicles, Ltd., of England and the Exide Division of the Electric Battery Company. 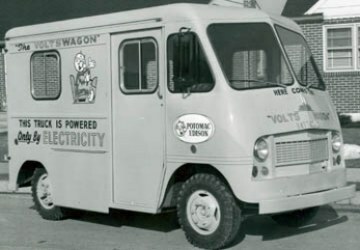 The first Battronic electric truck was delivered to the Potomac Edison Company in 1964. This truck was capable of speeds of 25 mph, a range of 62 miles and a payload of 2,500 pounds. Battronic worked with General Electric from 1973 to 1983 to produce 175 utility vans for use in the utility industry and to demonstrate the capabilities of battery powered vehicles. Battronic also developed and produced about 20 passenger buses in the mid 1970s. Two companies were leaders in electric car production during this time. Sebring-Vanguard produced over 2,000 "CitiCars." These cars had a top speed of 44 mph, a normal cruise speed of 38 mph and a range of 50 to 60 miles. The other company was Elcar Corporation which produced the "Elcar." The Elcar had a top speed of 45 mph, a range of 60 miles and cost between $4,000 and $4,500. In 1975 the United States Postal Service purchased 350 electric delivery jeeps from the American Motor Company to be used in a test program. These jeeps had a top speed of 50 mph and a range of 40 miles at a speed of 40 mph. Heating and defrosting were accomplished with a gas heater and the recharge time was 10 hours. Several legislative and regulatory actions have renewed electric vehicle development efforts. Primary among these is the 1990 Clean Air Act Amendment, the 1992 Energy Policy Act, and regulations issued by the California Air Resources Board (CARB). In addition to more stringent air emissions requirements and regulations requiring reductions in gasoline use, several states have issued Zero Emission Vehicle requirements. The "Big Three" automobile manufacturers, and the Department of Energy, as well as a number of vehicle conversion companies are actively involved in electric vehicle development through the Partnership for a New Generation of Vehicles (PNGV). Electric conversions of familiar gasoline powered vehicles, as well as electric vehicles designed from the ground up, are now available that reach super highway speeds with ranges of 50 to 150 miles between recharging. Some examples of these vehicles are the Chevrolet S-10 pickup truck, converted by U.S. Electricar and no longer available. It was powered by dual alternating current motors and lead acid batteries. It had a range of about 60 miles, and could be recharged in less than 7 hours. The Geo Metro, converted by Solectria Corp., is an electric-powered 4-passenger sedan powered by an alternating current motor and lead-acid batteries. It has a range of 50 miles, and it can be recharged in less than 8 hours. During the 1994 American Tour de Sol from New York City to Philadelphia, a 1994 Solectria Geo Metro cruised over 200 miles on a single charge using Ovonic nickel metal hydride batteries. The "Big Three" automobile manufacturers are also developing electric vehicles. An early 1990s vehicle was the Ford Ecostar utility van with an alternating current motor and sodium sulfur batteries. The top speed was 70 mph and it had a range of 80 to 100 miles. While about 100 Ecostars were produced, it was considered an R&D vehicle and never offered commercially. Ford is now offering an electric version of its Ford Ranger pickup. It has a range of about 65 miles with its lead acid batteries, has a top speed of 75 mph, it accelerates from 0 to 50 mph in 12 seconds, and it has a payload of 700 pounds. General Motors has designed and developed an electric car from the ground up instead of modifying an existing vehicle. This vehicle, called the EV1, is a 2-passenger sports car powered by a liquid-cooled alternating current motor and lead-acid batteries. The EV1 had a top speed of 80 mph, has a range of 80 miles, and can accelerate from 0 to 50 mph in less than 7 seconds. In addition to the EV1, General Motors offered an electric vehicle Chevrolet S-10 pickup. This vehicle has a range of 45 miles, it accelerates from 5 to 50 mph in 10 seconds, and it has a payload of 950 pounds. Other electric vehicles that were available in the 1990's included the Toyota RAV4 sport utility, the Honda EV Plus sedan, and the Chrysler EPIC minivan. These three vehicles were all equipped with advanced nickel metal hydride battery packs. Nissan has announced that they will place limited numbers of their Altra EV station wagons in California fleets during 1998. The Altra is equipped with a lithium-ion battery pack. In addition, both Ford and General Motors have announced that during 1998 the Ranger, the EV1, and the S-10 pickup wouldl be available with nickel metal hydride battery packs. While the vehicles satisfied the driving requirements of many fleet operators and two-car families, the cost of $30,000 to $40,000 makes them expensive. However, this cost can be considerably lower when tax credits and incentives are included. Large-volume production and improvements in the production process are expected to reduce this price to the range of current gasoline-powered vehicles. Check to make sure your auto insurance covers your auto properly. Want to protect the hybrid car? Compare car insurance quotes instantly. ©2009-2017 ElectricAndHybridCars.com All Rights Reserved.